"They were kinda like a training ground for Grand Ole Opry. They'd make a star out of 'em, and the Grand Ole Opry would grab 'em." In the years after World War II, what had been known as "hillbilly music" began to evolve into what is now known as country music. One of the key influences was the radio program Louisiana Hayride, out of Shreveport, which created a number of stars with crossover appeal to the popular charts, including Hank Williams, Elvis Presley, and Johnny Cash, among others. This 1984 documentary from the Louisiana PBS, narrated by Hank Williams Jr., takes a look at the phenomenon that ran from 1948 to the late 1950s and its repercussions on the music industry. As one would expect, there's plenty of still photography and talking heads recollecting the Hayride, the latter apparently shot in the early 1980s when there were still plenty of people who had appeared on the program around and a large contingent who still remembered and loved the program. There's a pleasing helping of clips from the radio program, and a surprising amount of period film of the singers in live performance, including Hank Williams Sr and Johnny Cash; Elvis is oddly missing from the film footage, possibly as a result of rights issues. In viewing such a program, one tends to treat its claims of importance with some skepticism. But the actual country stars themselves appear here and credit the Hayride program with launching their careers, so they certainly bear some credence. It helped that radio station KWKH (named for owner W.K. Henderson) had nationwide coverage through its 50,000 watt antenna, and in later years it was formally picked up by CBS and Armed Forces Radio. There's also ample credit given to the house backup bands, who over the years included such future major stars as Faron Young, Floyd Cramer, and Johnny Horton. Some of these band members get their chance to shine in a reunion performance of The Orange Blossom Special. The story is a fascinating one, especially in how the Hayride gave the stars their starts. For Hank Williams, it was giving a large audience the experience of his yodeling Lovesick Blues, and for Slim Whitman the wild Indian Love Call. Jim Reeves, hired as an announcer, took center stage as a fill-in when Sleepy LeBoeuf didn't show up. Horton's rocket to stardom was fueled by a chance performance on the Hayride of a tune he'd heard on the radio, The Battle of New Orleans. 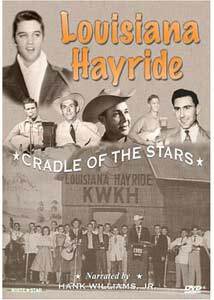 And for one incredible year in the early 1950s, the Hayride featured not only Elvis every Saturday night, but a young Johnny Cash too. While Elvis' meteoric rise was fueled by the weekly appearances on the show, several blame the decline for the show on him: not only did no one want to follow him, but everyone started trying to imitate him too. While the backstory is interesting, the performances won't be enough to satisfy the fans of this period of country music. At most there are short clips (though there are fairly substantial ones of Williams, Presley, Cash, and Jim Reeves). It's a good documentary that leaves you really wanting more. Image Transfer Review: The original full-frame television presentation looks fine for being shot primarily on video (the archival film footage often appears slightly better than the more modern interview segments). A few still photos have some aliasing, but overall this looks quite acceptable. Audio Transfer Review: The 2.0 audio suffers from significant hiss. The period radio broadcasts sound exactly like what they are: 50+ year-old radio broadcasts. The intros crediting Exxon are plagued by massive distortion, but the program itself is fine. Extras Review: There are no extras. It would have been wonderful to have included audio of a full Louisiana Hayride program to give the modern listener a sense of the show itself, but no doubt rights issues precluded such an extra being included. That's a shame. Chaptering is thorough. A look at the crucible that formed much of modern country music and gave a start to many of country's biggest stars. The transfer's acceptable for what it is, but there are no extras.